Whether folklore or fact, many of us would like to believe that our dogs can detect unexplained or invisible presences, guided by a canine sixth sense. It's exciting, and comforting, to think a favorite dog is sensitive to a departed relative or friend. But hard evidence of dogs' extrasensory perception is elusive and anecdotal. The 2009 book "Tails of the Afterlife," by Peggy Schmidt, chronicles multiple instances of unexplainable actions by dogs who apparently interact with something, or someone, unseen. For instance, she writes about a woman named Del Johnsen who left seven dogs and six cats when she passed away. Numerous witnesses believe she still visits her pets daily, and report seeing the animals suddenly gather in one spot, cats arching their backs and purring, dogs flopping over for a belly rub, wriggling in enjoyment, all of them sitting at attention and staring into the air before resuming their own activities. And Schmidt says her own Jack Russell terrier Pixie has repeatedly reacted to ghosts present in local buildings rumored to be haunted. But your pet's so-called sixth sense may simply be the result of his keen hearing, exceptional nose, and a dog's eye view on the world that allows him to sense small movements that escape our attention. A dog's senses are keener, and different, than ours: His eyes detect more delicate movements; his sense of smell is 1,000 to 10,000 times more sensitive than a human's. He can hear much higher frequencies, and at four times the distance of a human with normal hearing. Wild and domestic animals, including dogs, seemed to sense the impending Indian Ocean tsunami in 2004, displaying their distress with behavior changes and vocal warnings, and either ran for cover or refused to go outside. Some experts believe they could sense vibrational changes on land from impending the earthquakes before humans could. 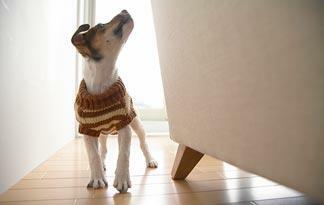 Dogs' heightened sense of smell is credited with their ability to detect some cancers in humans. Service dogs who aid seizure-prone people are alert to subtle shifts in body smells and dilated pupils, signs that enable the dogs to warn their owners of a looming attack. As for a sixth sense connecting to the supernatural or paranormal, pet psychologist Marti Miller believes that both dogs and their owners possess one. "But humans judge or deny what they are feeling," says Miller, who is based in Austin, Texas. "Dogs don't judge what is going on in the environment. While our own minds start to analyze what is happening, dogs don't do that. They feel the barometric pressure change, and may react by shaking, panting, salivating and feeling anxious, or they may not react at all." Miller says dogs' varying reactions to a shift in the atmosphere or unrecognized sound or movement can stem from early traumas, such as being caught in a rainstorm, hurricane or tornado, or from "a cellular memory that they have brought with them to this lifetime." For dogs, "sensing the supernatural is natural because they don't judge it. People could see auras or spirits, but they either don't believe they exist, or think that if they do exist, we could not see them." Animal Planet's own series "The Haunted" includes episodes with instances of family dogs reacting to the apparent presence of spirits, reactions that have no easy explanation for the out-of-the-ordinary behavior. Scientific studies on dogs' senses offer debatable evidence of dogs' psychic and sensory perceptions. In his 1999 book, "Dogs That Know When Their Owners Are Coming Home and Other Unexplained Powers of Animals: An Investigation," biologist and author Rupert Sheldrake presents a five-year exploration into canine behaviors. His work is based on the experiences of thousands of dogs and owners whose arrival home at unexpected times did not surprise their pets, who reacted with anticipation. Sheldrake concludes that "there is a strong connection between humans and animals that lies beyond present-day scientific understanding." When watching your own dog during activities in your household, or when you take him visiting, you may see him fasten his attention on something you can't see or hear. You may shrug it off as anxiety or reaction to an unfamiliar smell. Or just maybe, you suspect your own pooch is communing with the unseen. Because dogs can't talk to offer their own explanations, there's no way to know what exactly is going on. "The simple answer is, we don't know that dogs see ghosts or spirits," Miller said. But she adds, "If you observe a dog standing in the corner, barking at nothing visible, then there's a pretty good chance that he's barking at an entity, spirit, or energy that doesn't belong there." A distant noise, an unseen spirit or fresh cut of meat? You decide.